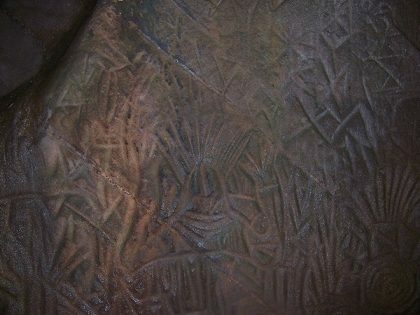 8000 Year Old Kerala Edakkal Caves Carvings: Lav Kush Connection? God’s own country Kerala will surprise you every now and then with wide sandy beaches, waving palms, glistening backwaters, lush green hills, and what not! Do you know the Wayanad forests of Kerala have been inhabited for several thousand years? 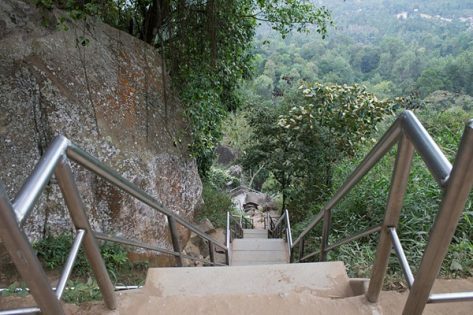 Ambukutty Mala in this hill forest, set high on the Western Ghats with altitudes ranging from 700 to 2100 m, is home to the Edakkal Caves. Two natural caves comprise Edakkal, having archaeological evidences of a civilization that flourished in this region dating back to around 6000 BCE! ‘Edakkal’ means ‘a stone in between’. The cave is a cleft or rock shelter naturally formed out of a strange disposition of three huge boulders making one to rest on the other two. The bottom boulder juts out in between and serves as the roof. 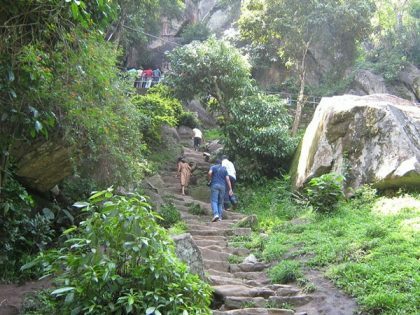 To reach these historic caves, one has to trek through the Ambukutty Mala. 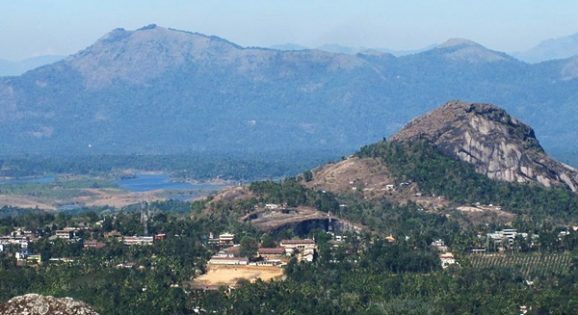 Do you know Ambukutty Mala served as an ancient trade route connecting the ports of the Malabar Coast to the high mountains of Mysore? And Malabar, comprising the entire south-western coast of the Indian peninsula, had been an important centre of trade in ancient and medieval India as per historical records. According to Sumerian records, Kerala was a major exporter of spice to Babylonia, Egypt, Assyria, Arabia, and more countries dating back beyond 3000 BCE. According to local folklore and legends, Edakkal Caves were formed with the arrows fired by Lav and Kush, the sons of Shri Rama. Pulpally, located at a distance of around 32 km from Edakkal Caves, has the only Lav Kush Temple in Kerala. 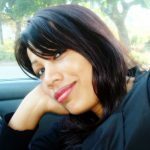 Did Sita, Lav and Kush spend some time in the Wayanad forests of Kerala? Folklores have some truth that follow a oral tradition of passing the contents from one generation to another with hardly any written records. And many folklores are based on historical facts. Hence this folklore on Lav and Kush having a connection with the Edakkal caves seem true. According to another version, the caves are abode to Goddess Mudiampilly. The hill summit serves as an annual pilgrimage spot for devotees of the Goddess. The carvings of Edakkal Caves are the only examples of Stone Age carvings from the southern part of India. There are two chambers inside the cave with the upper chamber at a length of 96 ft, width of 22 ft and height of 18 ft. The lower chamber is 18 ft long, 12 ft wide and 10 ft high. There are carvings of human and animal figures and tools used by humans on the walls of the caves. 429 signs including Tamil and Brahmi Script have been discovered here. Few of the carvings bear resemblance to the Indus Valley Civilization. The carvings are divided into three age groups, ranging from 6000 BCE to 1000 BCE. A group of the paintings have a connection with the Indus Valley civilization, thus linking the north, north-west with the south. Human figures in these carvings have raised hair and some have masks. A prominent figure among them is ‘a man with a jar cup’. ‘Man with a jar cup’ symbol is the most distinct motif in the Indus Valley Civilization. This motif is found in the carvings in the walls of Edakkal caves. According to Warrier, the Edakkal carving has a two-dimensional human figure, which is a little different from the Indus Valley symbol. The jar, according to Warrier, is more or less same as those in Indus ligature. The historian also opines the symbols as part of compound letters similar to scripts. Valuable ideas could be deciphered from such letters. Similarity of symbols in Indus Valley and Edakkal caves corroborate cultural diffusion of the two regions of ancient India. 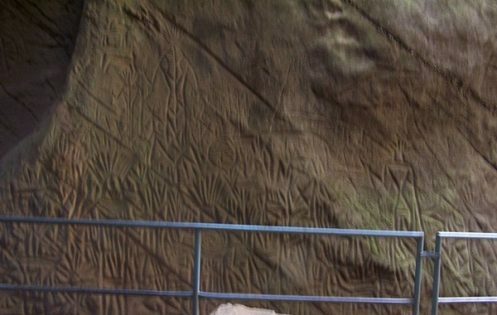 Warrier conducted further research along with history scholar Rajan Gurukkal to come to a conclusion that the inscriptions in the caves date back to the Iron Age. Fred Fawcett, a police official of the erstwhile Malabar state in British India in 1890 first discovered the anthropological and historical importance of Edakkal caves. He came across the caves by accident while on a hunting expedition in the Wayanad jungles along with Colin MacKinzie, a planter. Fawcett had a keen interest in visiting places and structures of historical importance and wrote about his experiences. Colin MacKinzie showed Fawcett the rock engraving in 1890. Fawcett visited the caves again in 1894 and 1895 and wrote about the drawings. It was based on his writings that archaeologists and anthropologists started studying the carvings. 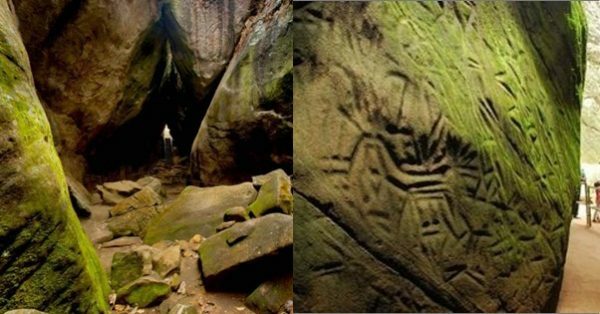 Participation and in-depth study of the stone carvings of Edakkal caves by experts related to rock art, inscriptions, symbols, and letters will help unearth more facts about an ancient civilization beyond the Indus Valley civilization that existed in South India. Probably more such pre-historic caves and monuments hidden below the earth are waiting to be unearthed to tell us who our ancestors were and the antiquity of our existence! 2. Throwing new light on Edakkal Caves, The Hindu.